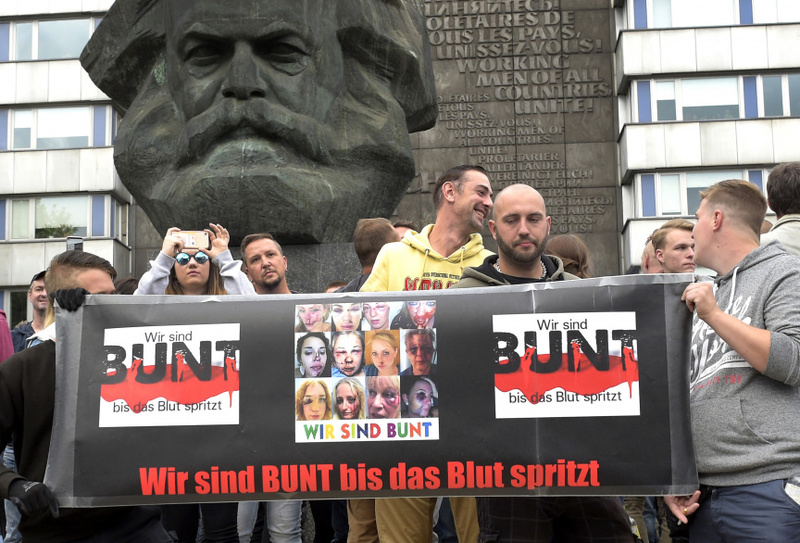 BERLIN (AP) — Far-right protesters in Chemnitz, one giving the stiff-armed Nazi salute, hoisted a large banner showing bloodied women's faces on Monday, above the words "we're colorful until the blood flows." But officials say the dispute stemmed from a verbal altercation between two groups, and harassment of a woman wasn't part of it. Anti-migrant sentiment in Saxony, the eastern state where Chemnitz is located, is high, with about a quarter of voters backing the far-right Alternative for Germany party in last year's election. "There is absolutely no evidence that harassment was a reason for this dispute," a spokeswoman for Chemnitz prosecutors, Ingrid Burghart, told The Associated Press on Wednesday. Two years ago, Russia's foreign minister and the country's state media claimed a 13-year-old girl of Russian origin known as "Lisa" had been abducted and raped in Germany, prompting street protests in Berlin. During Monday's protest in Chemnitz, at least 18 people were injured when far-right extremists clashed with counter-demonstrators as police tried to keep the two sides apart. "The mobilization was based on anti-foreigner comment, false information and conspiracy theories," said Michael Kretschmer, the governor of Saxony. He, too, told reporters that "there is no reason to believe there was a dispute involving the protection of a woman and that this is the reason for the crime."